After 40 years of tent and tailgate camping we decided adding more creature comforts would make the time spent in the backcountry even more enjoyable. 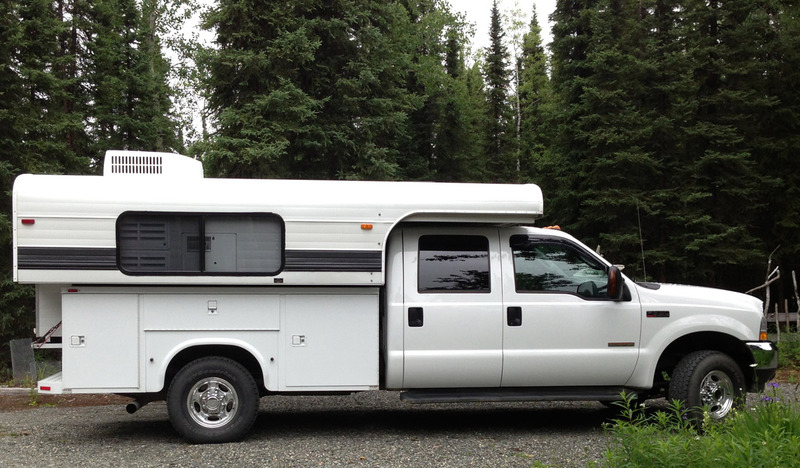 Therefore after much research we decided to buy a used Alaskan Camper mounted on a 4×4 truck. We like the telescoping feature to raise and lower the top as well as the hard sides which provide better insulation, protection and the ability to mount an A/C unit on the roof. Our favorite creature comfort is the cassette toilet. No more forays in the dead of night to answer the call of nature! The workmanship in an Alaskan is prime with curved wood paneling and attention to detail. An Alaskan was on our wish list for 3 years as we checked out different camper options and searched for a used Alaskan. Alas, each time we found a camper of interest, someone else beat us to the purchase. I would get excited to find an ad, make the call and the reply would be, “sorry, I just sold it” or “I will put you on the list if the other 4 buyers in line fall out”. One morning after yet again missing out on a purchase for a used camper I thought to myself, “why don’t you just pick up the phone and call the Alaskan HQ in Washington?” I had already called a time or two before. Yet I listened to that little voice that sometimes whispers to my heart and decided to pick up the phone. Brian at HQ answered and I wryly asked if any used campers had become available since I checked his website only minutes ago. To my surprise Brian answered that he was in the process of posting a new ad. With excitement I got the seller’s name and phone number, hung up and immediately called. The seller exclaimed that I was the 1st person to inquire and was amazed that they had only just given the details of their ad out to Brian. What?! I was the 1st to call? The price was right and they were selling their 4×4 Ford 350 utility truck and Alaskan camper as a unit. The utility truck meant having the spare tire, tools and camping gear within easy access. This was just what we wanted. 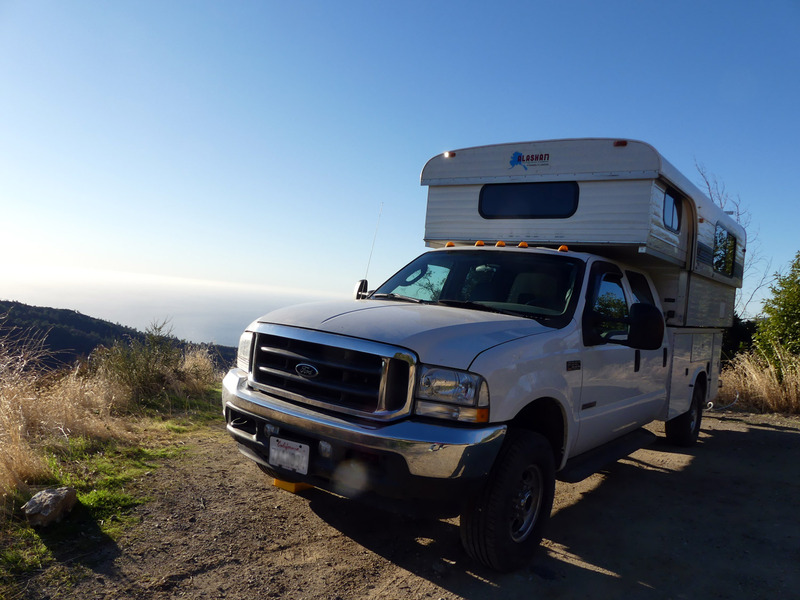 However the truck and camper were in Missouri and we live in California……road trip!! The seller’s phone started to “blow up” with cash offers by folks who could get there before us. We struck up a rapport with this dear couple and they honored us as 1st in line. My hubby and I decided to make the deal sight unseen after securing more photos and answers to our many questions. California gave us a torrential rain storm causing us to feel anxious in the heavy San Jose traffic, cutting it close to getting on the airplane in time. Dear friends offered to go along so they could drive our vehicle back and save us from having to make the detour home from Missouri. The weather in Missouri gave us sunshine and cool weather. This was perfect for us to “camp out” our 1st night in the seller’s driveway so we could learn the how tos before our maiden voyage home. The couple selling us the camper were delightful and we became instant friends. Their hospitality included delicious meals using their own preserves, our new favorite Texas Chocolate Sheet-cake recipe, and their adventure stories of living with grizzlies in Alaska. After going over the camper check list they created for us, we were on our way looking forward to a week long adventure of the drive back to California. We could bring very little other than our double sleeping bag as checked in baggage – cheaper than mailing it. So we shopped at our 1st experience of a Super Walmart and loaded the basket with a coffee pot, groceries, dishes and the like to stock our new home on wheels. This got us off in the late afternoon and we planned to camp our 1st night near the Kansas – Colorado border. After nightfall we stopped in Salina at a retro diner for a burger and continued to head for the border. In the dark we saw red lights glowing high above the horizon that seemed to be moving. We finally made out that we were driving past a huge windmill farm on both sides of the Kansas highway. The night got darker and it started to rain. Suddenly, lightning was sending furious forks of electricity to the ground all around us. The rain began to pound so hard it was difficult to see the road. So much for our plan to camp at the border. Pres encouraged me that he would drive past the weather and we would find camping in Colorado. By this time it was nearing midnight and I longed to stop and rest in our new, cozy little camper. The weather did indeed change – from rain to snow. We were on a highway in the middle of what seemed like nowhere in the black night and we watched for a rest stop or some place to park. However, a blizzard set upon us and once again the thought was to drive further until we could find a suitable rest stop. At first it seemed like an adventure driving through the snow. However that quickly changed as the fierceness of the storm hit full force, driving the blinding snow sideways, obliterating the road. Snow quickly covered all of the windows leaving only the windshield wipers giving us any vision. The truck engine stuttered and began to lose power so that we could only crawl along. The few and far between semi rigs had to pass us, spraying our windshield with snow causing momentary blindness. At least their tire tracks gave us some sort of marker to follow. Pres knew we could not stop as we would be buried. Our rig is all white and we would look like a snow drift if any snow plow was to come along the next day. The freezing temperature caused our wipers to start sticking to the windshield, groaning at the work load to keep wiping off the furious onslaught of snow. If the wipers stopped working, we would be completely blind. Pres is a very capable driver, and this was putting all of his skill to the test. I was praying for the truck to keep running as our lives now depended on it. Every muscle in my body was tense as my eyes strained to help Pres to see the road. I had visions of our truck plunging off a remote mountain pass, to be found the following Spring when the snow melted. I fought back the panic by praying for angels on our bumpers, for Pres to see the road, for the wipers to keep working……..with heightened awareness that as always, our lives are in God’s hands. Miraculously we had cell phone service so that I could find a Ford dealership with a map to follow. The nearest was in Denver, hours away. After driving all night we finally sputtered into the dealership at 4 A.M. The engine quit as we parked in the lot by the Service Department. The howling wind let up just as we were set to raise the camper and set-up so our tired, relieved bodies could crawl into our sleeping bag. My joy in making it there alive was overshadowed as I went to sleep. I wondered what terrible mistake we must have made, buying this rig sight unseen, and nearly costing us our lives! We awoke to the Service Dept. opening for the day, and went into the warm lobby for coffee and to arrange for our truck to be repaired. We had gotten a great deal on the rig so spending a bit more was still within our means. However, after waiting nearly the entire day for a repair estimate we were stunned at the price tag of nearly $10,000 for the extensive work to be done. The 40 gallon diesel tank lining had come apart and ruined the diesel fuel injectors. The brakes needed replacing for the mountainous drive home as well. The fuel tank had to be special ordered (this is now Friday) and we had hopes of it coming in no later than Tuesday of the next week. We decided we would have to sell our “new” rig upon our return home, as the added cost made it too costly to keep. Pres could have done the labor himself if we were home, but on the road we were stuck. We let the sellers know our predicament, and they were truly surprised as they had recently had the fuel injectors replaced by their own dealership with no mention of an issue with the fuel tank. Gratefully, the sellers offered to pay half of the repair bill to the Denver Ford dealership. We found an economy motel and rented a little red car and decided to use this down time to explore Denver and the beautiful surrounding area – to make lemonade out of the lemons we had been dealt. The weather over the weekend turned nice, making it great to hike and explore. If the truck had not broken down, we would have missed the beauty we now had time to discover. My anxiety grew as I needed to return home by the coming Friday for a flight with my boss to Seattle. Our plans for a leisurely drive home with a visit to see friends in Utah and our son in Nevada were now no longer feasible. The fuel tank did not arrive until late Tuesday, leaving us in a time crunch to return home. All of the folks at the dealership were sympathetic and worked to get us back on the road. Late on Wednesday, we finally hit the road with our truck ready for the long trek home. Pres did most of the driving (as usual) and 21 hours later we arrived safe and sound after driving straight through the night into California. This gave me just enough time to wash clothes and repack for the early morning flight to Seattle, whew! We were impressed that the dealership called to inquire that the truck was running well and we were happy with the repairs. If not for the blizzard incident, the fuel tank issue would have gone undetected and perhaps stranded us in a worse circumstance. The freezing temperature caused the viscosity of the diesel to thicken, and the damaged tank lining to finish coming apart. Because of the engine repair, the brake issue was discovered, saving us from them going out somewhere on a Rocky Mountain pass. All in all, God’s grace is apparent and we are grateful for how everything worked out. So back to the question, did we make a mistake buying the rig? After the costly repairs, the truck is running great and we are very much enjoying the creature comforts the Alaskan camper provides us. The sellers help to cover the repair costs made it possible for us to keep the rig. The end of March 2018 marks our 1 year anniversary to own an Alaskan.